Raspberries are perennial plants with woody stems. They are edible fruits of a multitude of plant species in the genus Rubus (rose family). Most of the species bear fruits immediately after planting (especially if planted in autumn) and reaches full yield in the third year. Some varieties and hybrids have berries one or several times a year, live on average 8-14 years and can achieve up to age 20 years old - even more if canes are properly pruned and older ones are replaced by new ones. Raspberries grow as a shrub with a height up to 3.5 m.
Due to long life span, when grown in backyard garden, some careful planning must be done, prior planting. For raspberries to grow normally, low temperatures are required during winter - about -7°C (-19°F) and below. Shoots can withstand temperatures as low as at -20°C to -25°C (-4 to -13°F), while the root system is little bit more sensitive – it can withstand temperature from -10°C to -15°C (14 to 5°F), without winter cover (snow will do fine). In spring, raspberries bloom rather late, so frosts rarely cause damage to the flowers. If the soil is not sufficiently moist during growth, yield is reduced, root system becomes weak and produces a small number of under-developed, weak canes. Raspberries are not very picky plants, but regardless if they are grown on plantations or in home garden, they will thrive in loose, slightly acidic (pH about 6) soil, rich in humus (above 3%). The root system grows up to 1m (3 feet) in depth, but the most of the roots is between 15 and 40 cm (6 and 16 inches). Raspberries like moist soil, but not the soggy one - groundwater must not be closer to the surface less than 0.90 to 1 m (3 feet). If you have issues with high groundwater, raised beds are recommended solution. 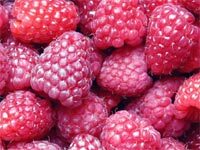 Raspberries are easily grown in larger flower pots – 60cm (2 feet) flower pot is large enough for 2-4 raspberry plants (depending on variety, growing conditions etc.). Just be sure to plant good plants into suitable soil and to water regularly, if possible with rainwater. In warmer areas, raspberries prefer northern sides of hills because it is colder, moister and moisture loss is slower. Altitudes of 400-800 meters are best suited for growing raspberries. The soil should be clean of weeds and rocks. One month prior planting raspberry plants, soil should be fertilized with manure and mineral fertilizers. Be sure to check pH of soil and if needed, adjust it. Also, adding humus is recommended since it slowly decompose and slowly release nutrients to the plants, keeps proper pH and improves soil in general. Proper amounts of N (nitrogen), P (Phosphorous) and K (Potassium) are very important for optimal growth. Home gardeners rarely have issues with raspberry fertilization, since their goal is growing healthy and great tasting fruits, with maximum yield being not so important. However, even home gardeners should know thing or two about NPK fertilizers for berries. - fruits are small and underdeveloped. On the other hand, if the plant gets too much nitrogen, it grows too large, but weak, young canes grows too strong in relation to older ones, often overshadowing them. Also, production is reduced, fruits are lighter, with dull colors and bad taste. Such plants have lower resistance to cold and various diseases. Therefore, it is necessary to find the optimum value – by observing the plants or by testing the soil using test kits. Phosphorus is also very important nutrient for proper growth of raspberries. Plants that grown on soil rich in phosphorus bloom earlier, have higher yields and grow healthier in general. Plants that grown on soil lacking phosphorus grown poorly, especially in areas with a lot of lime in the soil. - overall health of raspberry plants. - leaves tend to bend down, with the dry edges extending upward. It is really hard to expect raspberries to grow normally and have great tasting fruits in such conditions, right? It is recommended that potassium should be in the form of sulfate, since raspberries are very sensitive to chlorine. Magnesium deficiency occurs in acidic soils or soils with high amount of active lime. Magnesium is very mobile within the plant and its lack is easily observed on both new and old leaves. Chlorosis and leaves discoloration in general with upward curving of the leaves edges are main symptoms of magnesium deficiency in raspberries. Recommended dose of MgO are 6-10 g per square meter, in the first two years. Note that too much of ammoniac N or K prevents the absorption of magnesium. 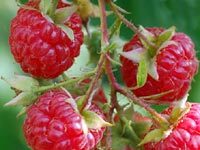 All of these issues are enough reasons for me to grow my raspberries using fertilizers optimized for berries in soil mixed by me – this is of course possible in small gardens, when price of produced fruits is not important. It is very important to get new plants from established growers and garden centers/nurseries. Only healthy new plants can guarantee success with raspberries. Choose variety according to your position, growing conditions and needs. Support system depends on the variety used, but the most commonly used is based on wooden and/or concrete poles, up to 2.5 m (8 feet) in height, 8-10 cm (3-4 inches) thick, with galvanized wire in three to four rows. Again, height and number of wires depend on the planted variety. - in the spring, add nitrogen fertilizer, around 60g per square meter, twice; manure once, if required; humus from time to time. - MgO and Fe if required. Raspberries should be pruned until middle of the May (depends on location, of course) - remove two-year canes, one-year redundant canes and anything that is damaged or ill. Canes bearing fruits should be cut to the height of 1.2-1.5 m (4-5 feet). Raspberry ripens in late June or around 25-30 days from flowering with harvest lasting 15 to 30 days. The difference between early and late varieties is 8-10 days, sometimes more. Raspberries are harvested when the fruit gets its characteristic color and when fruit can be easily separated from the plant. Berries are harvested every second or third day from the same plant – with sufficient plants and with various varieties, home garden can supply fresh raspberries on a daily basis for longer period of time. Growing raspberries in containers has both benefits and drawbacks for backyard gardener. The best choice for container gardening are smaller and sturdier, everbearing raspberry variants, but all other will do fine, if proper conditions are met.